medium – Cast bronze with stainless steel time capsule within. A poster & limited publication accompanies the piece to help give some insight into the project and allow me to share some of the physical processes of its creation and in turn reveals some of the thoughts and reflections stored within. 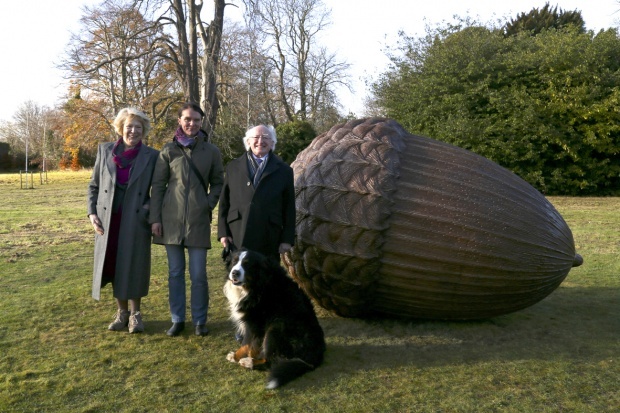 It has been a great honour to be given the opportunity to realise this sculpture on the grounds at Áras an Uachtaráin, where many ancient oaks grow in the surrounding woodlands. 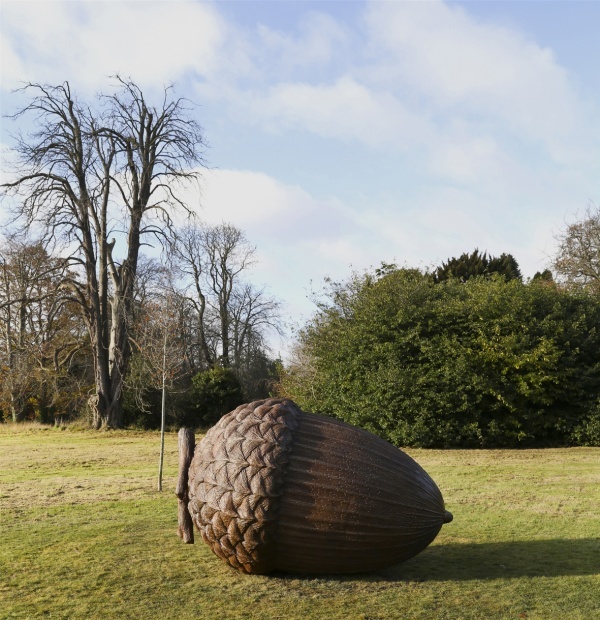 The acorn sculpture is modelled from the seed of our national tree, the native Sessile Oak – the Quercus petraea. The nut or seed determines the form of the tree and in turn the tree nurtures the seed. As well as a simple metaphor for life’s cyclical journey, I feel that it is an appropriate and enduring symbol to commemorate the centenary of the birth of our national independence and our aspiration towards growing with maturity, optimism and wisdom for the future. A seed is like a time capsule that carries its own history and also a kernel of knowledge that contains the beginning of the future tree. The time capsule within this sculpture houses the many memories and wishes written across two generational groups. The first stage of this project was to commence the writing workshops collaborating with poet Enda Wyley. We were working from the core, the most important part. It was a privilege to have this opportunity to work with people who so willingly shared their personal thoughts and memories about the world, the environment, their families, their hopes and their worries. 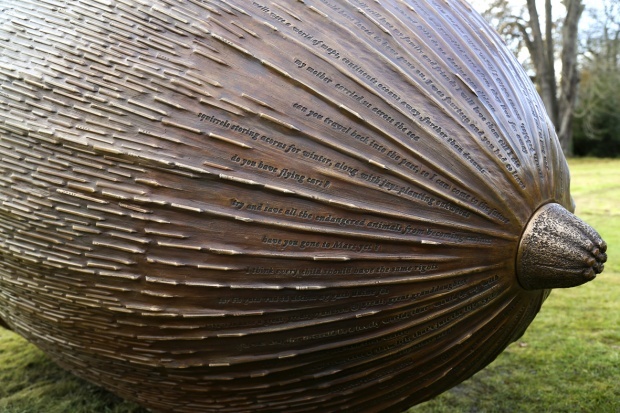 As homage to the content within, all the schools and individuals that participated in the project donated thousands of their own pencils that I then integrated within the fibrous surface texture of the acorn. In this way, the voice of the individual was aloud to shine while becoming an invaluable part of the whole. 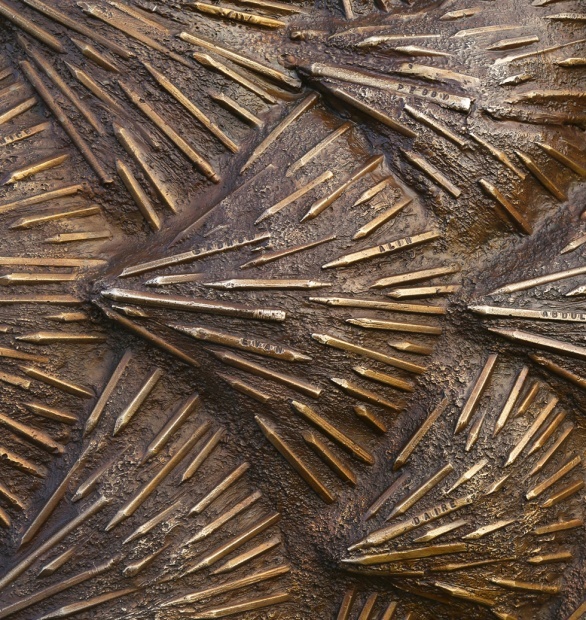 All the first names of the people who took part are embossed onto the surface of the bronze to hint at the rich cultural diversity that now exists in Ireland. 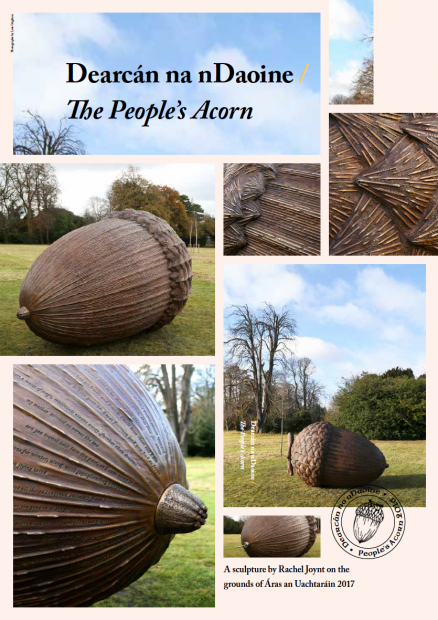 On the surface of the acorn, extracts of the writings radiate towards the fibrous tip, giving us a glimpse of the rich material within. This tip also acts as the access lid to the time capsule that will stay sealed and locked until 2116. While I was working on the sculpture I had a strong sense that it was not going to just be a hollow casing of bronze but also that it would act as a durable shell to protect all the hopeful and insightful desires and wishes contained within it. For this reason I did not feel alone during the many months spent in my studio integrating the personalised pencils and extracts of writing, they kept me company. I hope this publication helps give some insight and allows me to share some of the physical processes of its creation and in turn reveals some of the thoughts and reflections stored within. The magical ‘lost wax’ bronze casting technique is an ancient tradition that has not changed significantly for centuries, the knowledge handed down within foundries for generations. An appropriate process to create the acorn shell that will house rich histories for the future to enjoy. I hope this work will endure and remain a relevant symbol to reflect on the momentous events a century ago and our continuous growth as a young nation. A place to reflect on the recent past but also a space to consider all the potential and possibilities of the future.